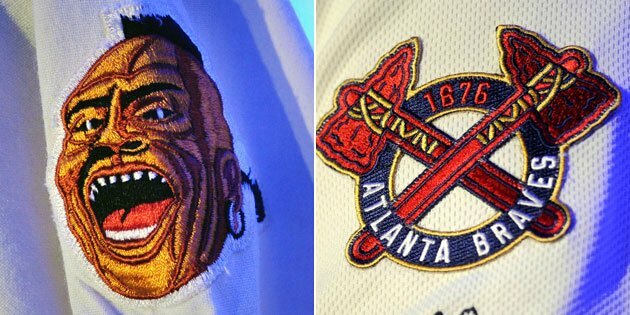 By 'DukIt was a complete no-brainer, but props to the Atlanta Braves for placing a new crossed tomahawk logo on the sleeve of their new weekend alternates. The cream-colored throwbacks—which the baseball world learned about a few weeks ago—are based on the uniforms that the team first wore after moving to Atlanta in the 1960s. Thankfully the current Braves brass made the necessary alterations before the retro resurrection so that paying tribute to the franchise's history is possible without alienating a group of people in the process. Comment: A no-brainer...because the crossed tomahawks are so much more sensitive than the leering, shark-toothed savage. Gee, thanks for your sensitivity. With the emphasis on "more" sensitive. As in slightly more sensitive. Alternate headline: "Braves replace one insensitive patch with another." For the double implication that Indians were killers and evildoers, the Braves get a Stereotype of the Month entry. For more on the Atlanta Braves, see Braves Haven't Helped Choctaws and Former Noc-A-Homa = (Oxy)Moron.